At the beginning of our trip, I remember remarking to Matt about how little had changed in the Boundary Waters since we started going there almost ten years ago now (20 for Matt). 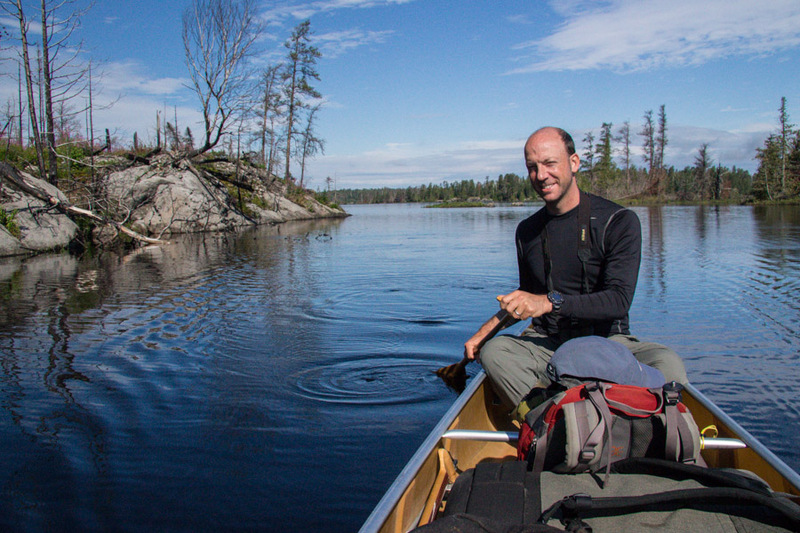 The water might be a little higher or lower, the animal sightings might be a bit more frequent or far between, the weather might be pleasant or dicey, but we pretty much know exactly what to expect when we head into canoe country. That is part of the joy of returning to familiar territory. So, imagine our surprise when we headed into Insula, a lake that we know quite well from previous experience, to discover that the entire southern portion of it had been ravaged by fire. And it wasn’t just Insula either. In fact, almost the entire stretch from Insula out to Lake One had been incinerated and was almost unrecognizable to us. the smell of smoke in the air was from a fire burning in the Boundary Waters, over 400 miles to the north! But the following summer, instead of heading north to canoe country, we were lured to Colorado by a friend’s wedding and the opportunity to try some backpacking in the mountains. As a result, we skipped the first canoeing season after the fire when it probably would have been a hot topic in Ely. Now that another summer had passed, our outfitter probably assumed that we knew about the fire and the extent of its damage; nobody mentioned it to us at all. At first, we were kind of shocked and heartbroken to see the once beautiful shorelines and campsites in such a horrible state. Once stately trees now pierced the sky like charred toothpicks. The lush green understory was replaced by thick, tall grasses, with the occasional bright pop of pink fireweed dotting the eerie landscape. It was a struggle to find campsites that hadn’t been ravaged by the fire those last two nights, but we were fortunate and found pleasant sites on the northern shores of Insula and Lake Two. Lake One was our exit point for this year’s trip, and we found a Forest Service sign there explaining the events of the Pagami Creek Fire and the extent of its damage. Apparently, it all began with a lightning strike on August 18, 2011. The fire burned slowly and uneventfully for several weeks, but, in early September, the Forest Service took advantage of the natural fire to create a controlled burn of the area. All was well until the weather took a sudden and unexpected change on September 11. Extremely dry weather and fierce winds caused the fire to spread out of control from a manageable 1,000 acres to an alarming 93,000 acres over the course of a few days. Of course, fires are an integral component of healthy ecosystems, and, despite the overwhelming feeling of loss we had canoeing through the devastated area, we reminded ourselves that the Pagami Creek Fire will ultimately have a positive impact on the Boundary Waters. The high temperatures of the fire awakened dormant seeds, and new, light-loving trees will grow in this blank canvas, eventually enticing more varied bird and animal species. Moose, mice and snowshoe hares are attracted to the young plants that have begun to grow prolifically, which, in turn, will allow predator populations, such as lynx, wolves and owls to rise as well. 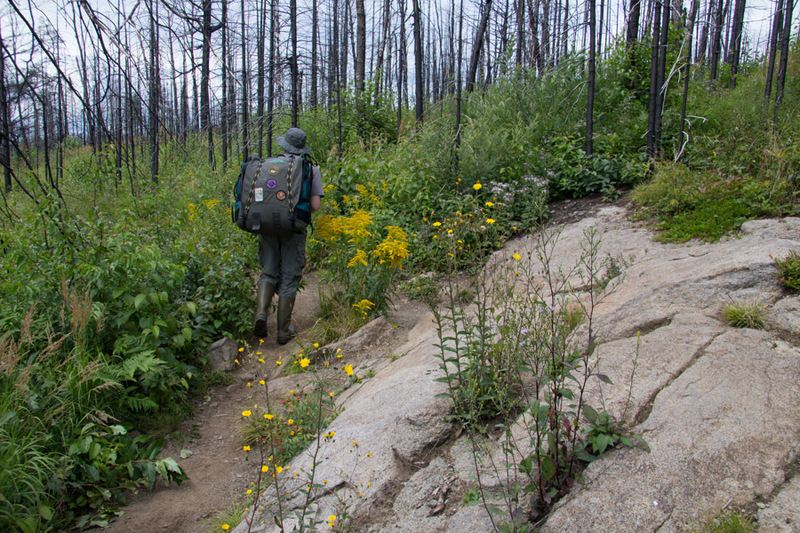 It will take a long time for this area of the Boundary Waters to return to its former glory, but, in the meantime, it does provide a fascinating look into the ecology of a wilderness fire. It will be interesting to watch how the area changes and becomes revitalized over many years to come. After being a reluctant convert, I now embrace the beauty that comes after the fire. After getting over our initial shock, we started to see that the burned areas had a strange beauty of their own. Yes, even your photos of the bare trees are stunning! I like the reflection of them on the water. Just imagine what this area will look like when you return 10 or 20 years from now. Will be incredible to compare! Thanks so much. We were lucky to get a calm morning and pretty skies for those shots. We will be anxious to see how the area recovers and transforms in the future. Time has its way of working wonders (at least in nature–on me, not so much! ).